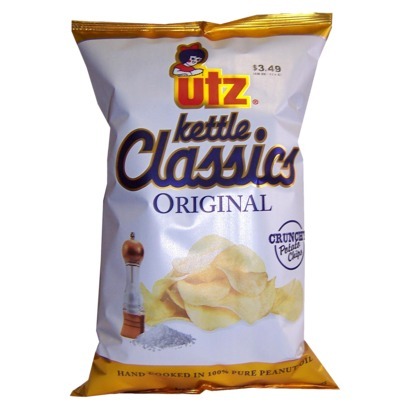 It may have had something to do with the cooking process, but these Chips had a vastly superior crunch to the Regular Chips in Utz's stable. There was a light, crispy snap, but the overall crunch was a nearer relative of the extra thick Kettle Cooked Chips style. Although these Chips were Kettle Cooked there did not seem to be many folded, curly, or bent bag constituents. They looked slightly more thick than Regular Chips, but not significantly so. There was minimal seasoning visible and there were not many brown areas on the surface of the Chips. While we do not consider ourselves particular adept at reviewing flavor free Chips at Chips & Crisps (they all taste much of a muchness to us), these Chips did seem to have a sweeter flavor than many barely Salted Chips. It may have been the Peanut oil they were cooked in, but as far as Plain Chips go, these were pretty good.